If you know me a bit, you know that I have a negative attitude towards signal providers. They usually offer impossible profits in tens of per cent per month, and then it ends. However, there are always exceptions. Today, I have prepared an interview with a friend of mine who has been involved in trading for a long time and who is one of the few responsible persons who provide their strategies to other people. The whole story is quite interesting, because I have met Peter as my employee – not in my current company, but at one of the brokers I had worked before as a business director. Peter was smart, and he was really responsible and rational person. And I told him what a rational manager should never say – I told him to leave and start to work for himself, because he could do more than that. After some time, I left and Peter stayed. But it did not last long, the ideas were born, and later he went on his own. So, let’s introduce Peter, a little different trader who is definitely not a gambler, as he is extremely conservative. Hello and welcome, can you shortly present yourself? Hi, sure. My name is Petr Slezák, and I am currently the co-owner of SMC ltd, which is engaged, among other things, in the development and distribution of automated trading systems and trading portfolios. These portfolios are used by customers of several brokers and institutions. My task is to supervise, control and service these systems and portfolios. That’s a lot of work, but let´s start from the beginning. How did you get to trading? This is quite interesting story. At high school, I wanted to buy a car. I was looking for ways to make money to buy a car. By chance, I got to a broker competition for a luxury car. The goal was to get highest gain with virtual money. At the time I thought I had nothing to lose and I tried it. At first, I was doing pretty well, despite the fact that I did not know what I was doing. Well, then have I deleted that account. That was my first encounter with trading. Did you then become more interested in trading? The idea of ​​trading attracted me, but I was not pushed enough to get actively engaged in trading. But I have started to read financial webpages regularly. It took several years before I found out that I was more and more thinking about what to do with my free money. At that time, I had worked for a company whose owner was trading intensively, and that gave me the primary impulse. We found a common interest and have started to be more interested in trading. 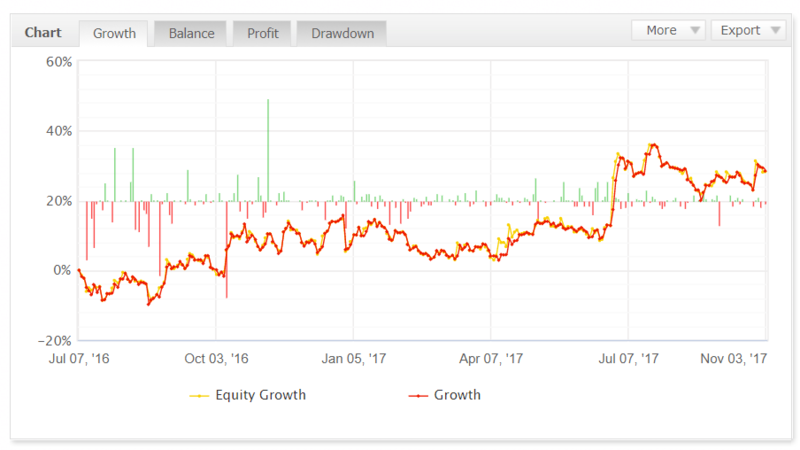 I opened my demo account, set up a simple strategy, and tried it. I saw that it is possible to earn tens of dollars in one trade. I thought it will be be a lot of money for nothing. 😀 It was big mistake. How do you mean it? Like every beginner, I thought that nothing can happen. I’ll open my real account, put in money, and then I’ll make money. I was convinced that if it worked on my demo account, it would be easily with real money. I had a basic system and I believed it. However, I did not have any risk and money management. I put the first money and started trading. As it should :-). Within two months I managed to increase my account 5 times. Then, instead of strict approach to numbers, I was thinking about what I’m going to buy, and it went to hell. My psyche got unbalanced and within a few weeks I got under my initial deposit, and I wanted to get my money back, so I lost the rest in one week. How did that affect you? It had to be quite a shock. I honestly wanted to quit everything. Mentally, I was at the bottom. But I have character of a pit bull. That’s why I have started to study intensively, where I made a mistake and why it turned out bad. I’ve found a fatal mistake in money management and risk management. It forced me to study more financial markets, approaches to them and various options. At that time, I got to offer to run commercial semi-automated trading systems for an emerging brand. That was the first time I have discovered the automated systems and I was absolutely fascinated by it. Only the idea that you “do nothing” and the machine is trading automatically was nice. So you have started with trading systems? Not directly. It was a long way. Literally a marathon. Back then I was doing IT, so programming was not a problem, but I thought it would be easy and it was not. Again :-). At that time I thought I was going to program the system, set it up and go. I did get that I must test it, try different settings, optimize, measure sensitivity and robustness, etc. I spent many hours behind my computer and completely cut off my private life, which made significant changes. Both with my relations and on myself. That’s why I have started to look for programs that would make the work easier and more effective. My friend told me about StrategyQuant. It is really magic program for me. How did StrategyQuant help you? It gave me freedom from slow testing in the MetaTrader, where the test lasted long and the optimization of the strategy was real madness. With this, I just told the program what I was looking for an on what basis, and the program through genetic programming found my request. And it’s faster, more efficient, and more accurate. In addition, it discovered ideas that I would never have found myself. How long did it take to build your first portfolio of strategies? It took me about half a year. About 900 hours of my time and some money. To take full advantage of the program’s potentiality, I bought a powerful PC that worked continuously. Which cost me the money. I had a simple idea at that time. Minimum risk in position, maximum portfolio drop 15% and profit above 15% p.a. 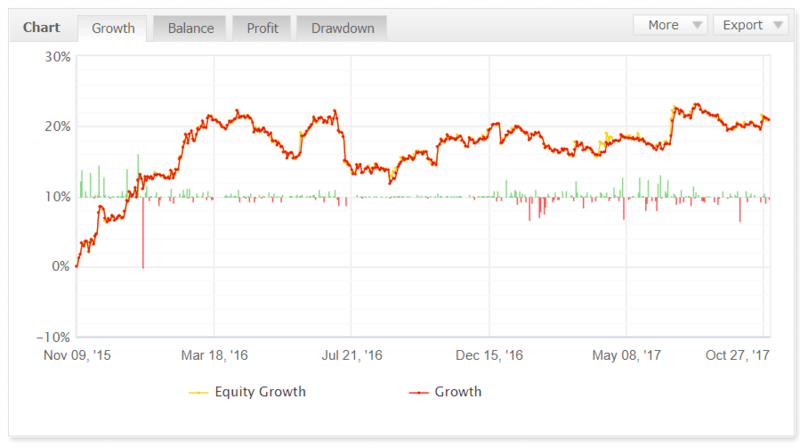 I have surpassed it and the maximum drawdown in my backtest reached 6%, with an average annual profit of 15%. I have to admit that to accomplish this number, I needed as much strategy as possible, and for my first version of the portfolio, I have also used strategies from friends who are also programming. Today, however, I have a portfolio of purely my own strategies, and I also have a more dynamic version based on the partner requirements, where I multiply the risk in position, but the portfolio is almost the same. What are you currently achieving on the real market? Our goal is to achieve 1% monthly gain on conservative portfolio and 2% on a dynamic one. Are you still developing new strategies, or you’re done and you’re just making profits? You need to always develop. I’ve already eliminated some strategies and put enough new ones into the portfolio. Over time I have realized that the tool is just a tool. What is important, is the output, what we want from our tool. That’s why we are still developing with new ideas and approaches with our team. Like closing the trades without exception on Friday, changing the risk during Christmas or over the summer, cyclicality of volatility, etc. There is plenty of it. Now, for example, I’ve been improving strategy for USDJPY for two months and I’m still not completely happy. I have a different approach then at the beginning, and I am a quitter compare to my friends. I have really extreme demands on the strategy, I want to have the risks to be very small, but it is due to my experience and also because our strategies are used also by our clients. I would not say a quitter, you’re just not a gambler 😊. However, how did you get to the possibility to offer the strategy to clients, are they end-customers? This decision was outcome of the previous work. I spent a lot of time developing my portfolio and the process was not for free either. Since I was a stock trader in the past, I knew that I need to obtain the licenses that I did not have, so I was not able to offer the strategies to the end users. That’s why I have decided to find brokers and institutions that have these licenses to manage funds and meet them in the Czech Republic. We have got to an agreement and I have offered the portfolio. They offer my portfolio to their clients who meet their suitability requirements – they are aware of the risks associated with trading on the stock market. My customers are brokers, and I do not have to deal with licences. In addition, my strategy has addressed a large number of potential clients who use them now. My concern is only to control, update and manage the strategies. 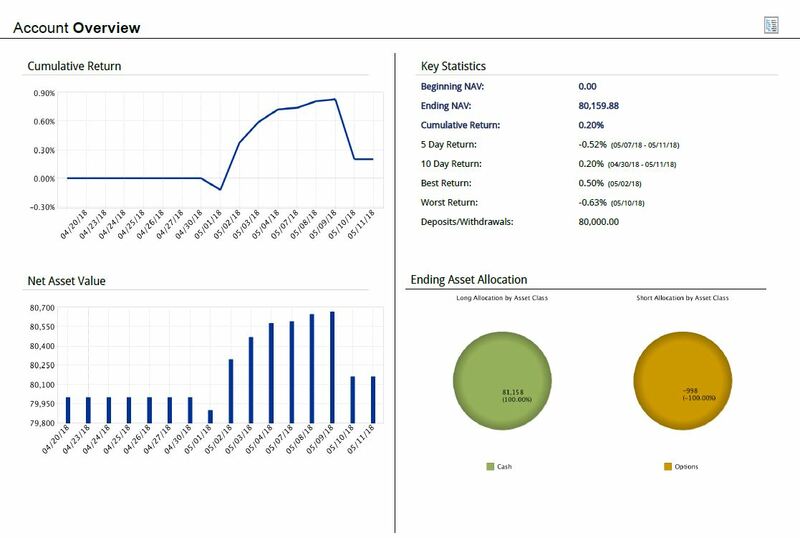 Brokers have their own asset manager, who then processes everything. Can you tell me how many clients and how much money are these portfolio managing? As I said above, I only work with brokers, so I do not have the end clients. However, the amount of money invested in the accounts managed by my portfolio is in millions of USD. This portfolio is composed of highly conservative strategies with minimal risk on position. The goal is to achieve a profit of about 1% per month in the long run. For Peter, a longer periods when equity is going sidewise is not a problem, the goal is to avoid high drawdown and minimize the risks. It contains more risky strategies and aims to achieve double profits than the conservative portfolio, but with correspondingly higher risks. What to say at the end? As you can see, Peter is a little different trader. He primarily follows the risks and takes the profit as a bonus for working with risks. That’s why his portfolio has been working for a long time. Equity is not like in a dream, but as I say – it’s real. If he would like to risk more, he could have higher profits. But Petr does not want high risks, he does everything so that his clients do not have to get nervous while they are facing drawdowns of tens of percent, etc. If you want to copy signals from someone, then I recommend people like Petr, who have a responsible approach and reasonable profits. Not traders who promise 20% per month but do not care about the risks. Thanks to Peter for the interview and I believe you have got some interesting thoughts from this interview. How was the first Fintech conference in the Czech Republic?